For more detail, you can go to our Terms and Conditions page to learn more about the services we offer. I’ve chosen the 2-4-6-8 stitch for Your Stitch to Try this time. 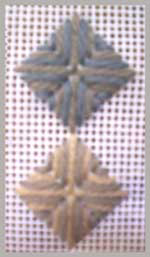 On the second and subsequent rows, the diamonds fit in the gap left by the first row-the stitch over 2 threads sharing a hole with the stitch over 6 threads of the previous row and so on. Now it’s time to try it as I designed it for the DECO Diamonds picture frame… this newsletter’s free design. This subtle picture frame design with its neutral-coloured textures, serves as soft background to your favourite family photos. As a background, it doesn’t distract from your photo, yet has interesting depth, which the texture provides. The 2-4-6-8 Stitch is the ideal stitch to give the subtle textures I was looking for. Click here if you want more background about this delicate picture frame design. 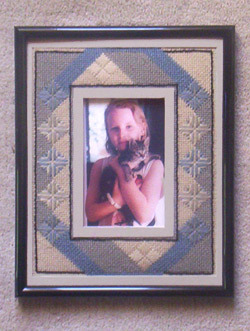 The rest of the picture frame is stitched in the Basketweave Tentstitch. Because the picture frame design is symmetrical, it will work with both horizontal and vertical photographs. The colours for this tapestry are very soft and delicate. However, for visual clarity when stitching, the colours are shown much stronger on charts. Please note: the back stitch, which is optional, is shown on the 12 gauge chart and not on the 13 gauge, so you can see the difference. All the wool yarn colours as stitched are from the Appleton Tapestry Colour Range, which are readily available at your local needlepoint shop or online. The codes shown on the 12 gauge Coloured chart refer to the yarn colours listed below. You will need one hank of each of the colours. I’m including DMC Laine Colbert wool yarn colours as well, if you have problem finding Appleton. They’re as close as possible to the Appleton colours. Purchased Picture Frame : Note: The black metallic frame I bought is approx. 8” x 10” (20 x 25 cm) : See Making Up Section for other options. Just as you practiced it, start up with the FIVE 2-4-6-8 diamond shapes for one side of the frame. The first code shown on the above 12 grid coloured chart designates the colour of yarn to use for the 4-8-4 stitches. The second code designates the colour of yarn to use for the 2-6-6-2 stitches. e.g. Look at the centre diamond. The codes A + C on the colour chart indicate that you stitch it with the wheat colour (A) with 4-8-4 stitches and the blue–grey colour (C) with the 2-6-6-2 stitches. Do all the diamonds first, and then add the Basketweave tent stitch around them. The canvas holes are shared with the tent stitch and the 2-4-6-8 stitch. The white canvas will show otherwise. 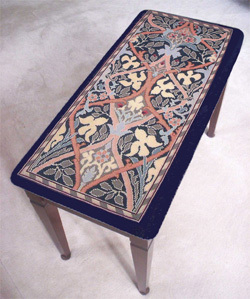 The fine black back stitch line is added after you finish the entire tapestry and is optional. 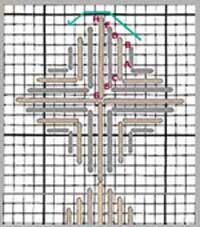 Once you’ve finished one side as above, you can complete the ends in the basketweave stitch. Note that the ends are not ‘mirrored’ so please refer to the chart. You’ll see from the Coloured chart above that I’ve added the 2-4-6-8 stitch at the two ends but it’s only in one colour (A). It adds a subtle textured detail to the ends. The back stitch is added after you’re finished stitching the entire tapestry. Once you’ve finished, you can block it if it’s become twisted. The metallic picture frame that I purchased to frame the needlepoint and my favourite family photo is approx. 8” x 10” (20 x 25 cm). You could go larger if you wish (but not smaller). The first thing I had to do was prepare the other materials. The above photo composite shows you the next steps. 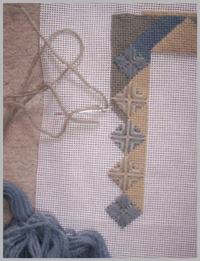 Trim the outside edge of needlepoint canvas to the dimension of the picture frame you purchased. (minimum width of approx. ¾’ or 2 cm) Don’t cut too closely to the stitches: you’ll need the width for attaching the art board mat after. Cut out the interior section of the canvas, leaving again enough canvas to attach the art board mat. 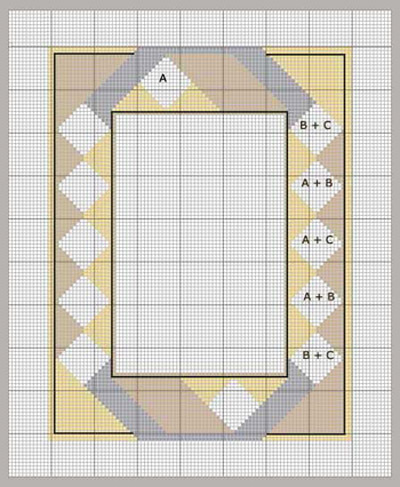 Cut the art board for the outside mat to the dimensions of the purchased frame and at a width to cover the canvas so it’s not visible. Cut the art board for the inside mat to cover the canvas and also to slightly overlap the edge of the photo you want to use. Attach the photo to the mat, and attach both of them to the canvas, all with two-way tape. Insert the assembled piece into your purchased frame. 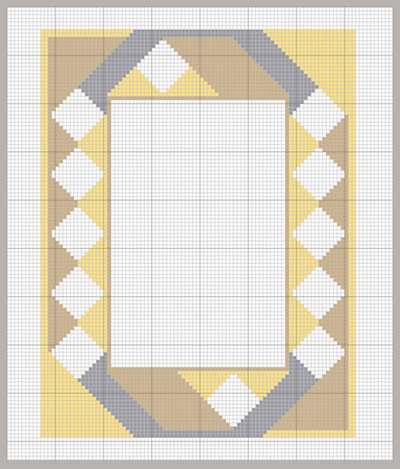 For a softer look, leave off the black backstitch and use a gold or brass frame. This would work well in a more traditional setting. For a more contemporary look, why not use a clear acrylic box picture frame? There are several sources online, to fit the dimensions of the ‘Deco Diamonds’ Picture Frame. That’s still me! With my interior designer hat on this time! First of all, please send me a few photos of some of the pieces, and the rooms they’re in, and I can help you personally. But I thought I’d include this question in this newsletter, because it’s a common situation. So here are some general tips that could help anyone with this interior design dilemma. I’m also including some photos at right, which illustrate how you could approach the décor of your home. Note how they mixed the periods. You’ll find in most traditional interiors that there is a great deal of pattern; with the carpeting, wall fabrics, draperies, upholstery, etc. This is not the case in contemporary interiors. So you could still use your existing furniture, and select materials for the above furnishings with a simple subtle pattern or no pattern at all. These will immediately ‘de-clutter’ you rooms and appear more contemporary. It’s not uncommon to see deep colours used in traditional interiors, particularly on the walls, with hand-painted wall fabrics, etc. Or all the walls are painted white or off- white, which has an amazing impact on modernizing a space. You could also put a strong plain colour on the upholstery of just one or two pieces of furniture to up-date them. Adding large abstract or semi-abstract paintings or modern sculpture to the above ideas will very definitely give it the contemporary look you want. I hope this gives you a taste of what is possible! Over the winter months (2009-2010)I’ll be developing needlepoint designs from handbag patterns which are readily available on the internet. I’m still working on new belt and seat cover designs! And some new cushion designs! The next VIVA ZIVA! Newsletter #0904 will be issued in January 2010 . 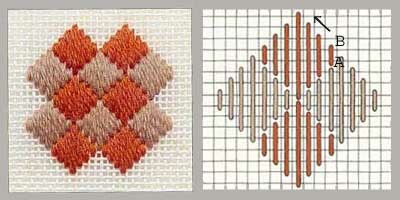 Free needlepoint design of 2 napkin rings . One traditional, and one more contemporary… to suit any dinner or lunch party!